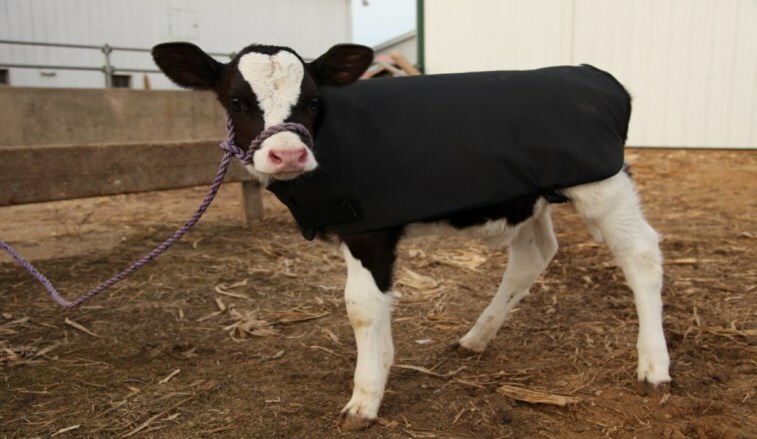 Calf Coats: Made by the farmer, for the farmer. Each calf coat is made from a tough outerwear fabric which incorporates antimicrobial qualities, UV resistant characteristics, breathability, abrasion resistance, water repellency and mildew resistance. Due to the nature of the fabric, manure and dirt can be brushed from the outer cover when dried, which markedly reduces the need for washing The calf coats are adjustable with durable Velcro neck straps and heavy quality adjustable leg straps. Each calf coat has an enclosed pocket filled with a dense sheet of felted wool approximately half an inch thick. Wool naturally wicks away any moisture from skin, thus adding an additional layer of moisture protection to the calf. The felt can be removed for washing and reinserted when the coat is dry. Research studies have demonstrated increased weight gain on young calves wearing calf coats because less energy is required by the calf to keep warm. The calf coat will minimize stress from cold weather, allowing essential feed energy and nutrients to be utilized for body weight gain. The calves will continue to require drying before calf coat use and need clean bedding and shelter. (1) Decreased energy loss by calf to keep warm. (2) Increased body weight gain by the calf due to more effective utilization of feed. (5) Two sizes are available. Each allows a snug fit while still allowing movement. If you would like to purchase multiple items from our store just order them individually and we will automatically ship in stock items together. If products are not in stock we will notify you to ensure a hassle free delivery process. Thank you!